The ultimate Subversion client for Mac just got better with Shelving, Checkpointing, and blazing fast performance. Get 7 day free trial or buy for $79 per year. Shelving takes the dirty state of your working directory — that is, your uncommitted modifications — and saves it as a shelf of unfinished changes that you can re-apply at any time. Often, when you’ve been working on part of your project, things are in a messy state and you want to switch tasks for a bit to work on something else. The problem is, you don’t want to do a commit of half-done work just so you can get back to this point later. The answer to this issue is the shelve command. SVN finally has a lightweight way to jump to previous versions of your work; we call them checkpoints. Remember, not every change you make will be ready to contribute back to the central repository. When working on a collection of local changes, save checkpoints of your work and restore the working copy to one of your previous checkpoints should things go awry. Checkpointing is the fastest way to work in modern workflows using SVN. Cornerstone is the the fastest SVN Client. Period. 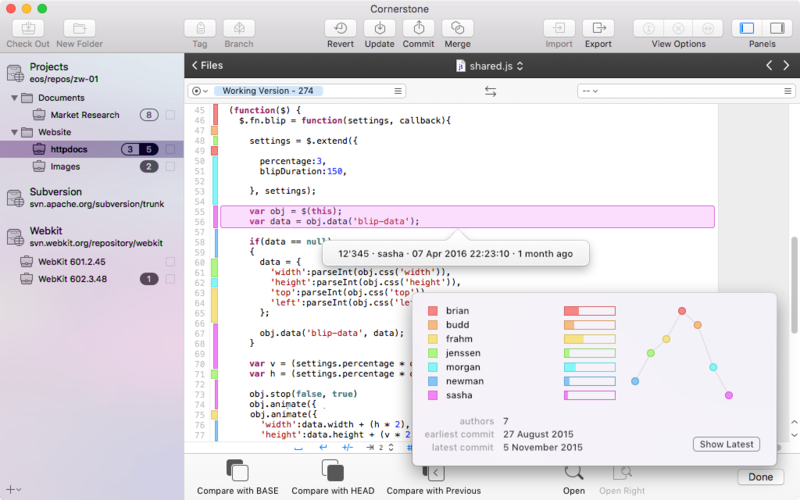 Cornerstone 4 has been rebuilt and optimized from the ground up to take advantage of MacOS High Sierra. 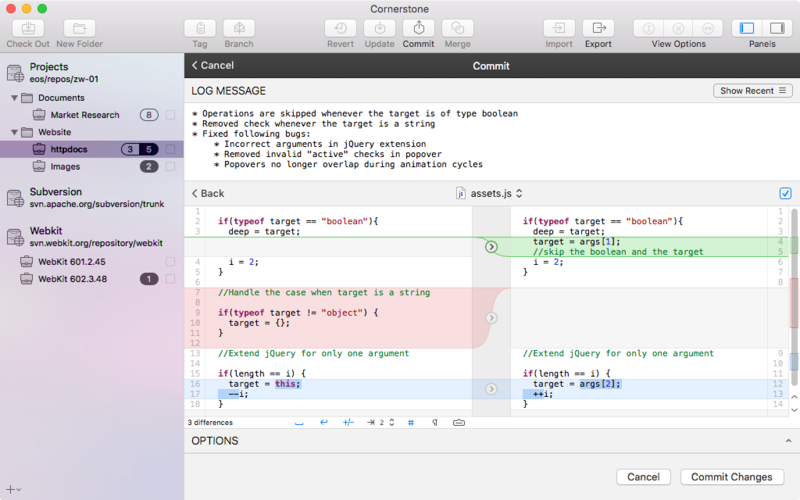 Get up to a 300% faster checkouts and updates compared to Cornerstone 2.x and 3.x. Instant overview of all the files in your working copy. 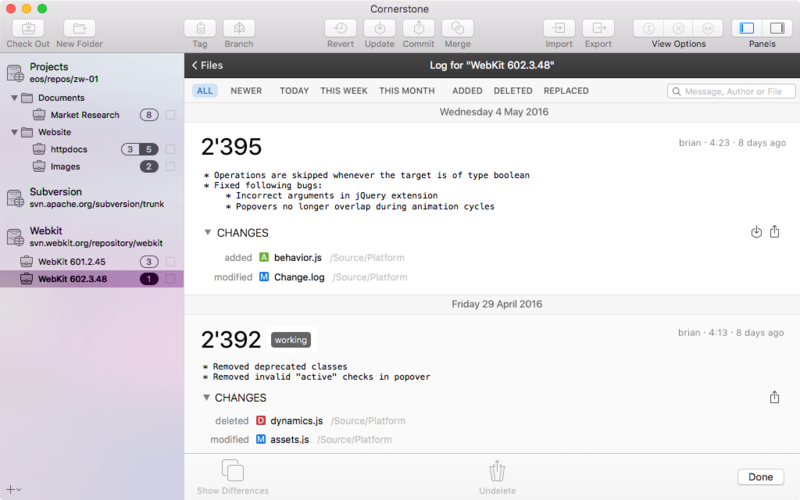 Because text comparison is built right into Cornerstone you can review changes and write log messages side by side. 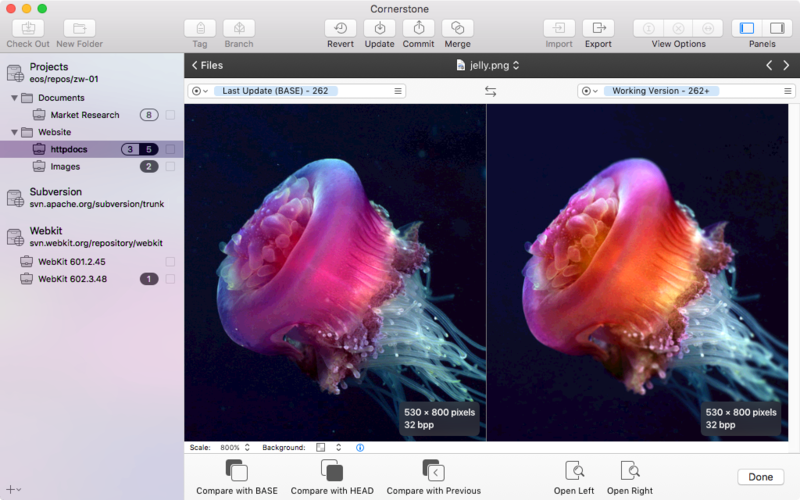 With super-fast image comparison built right in, there's no need to leave the comfort of Cornerstone. 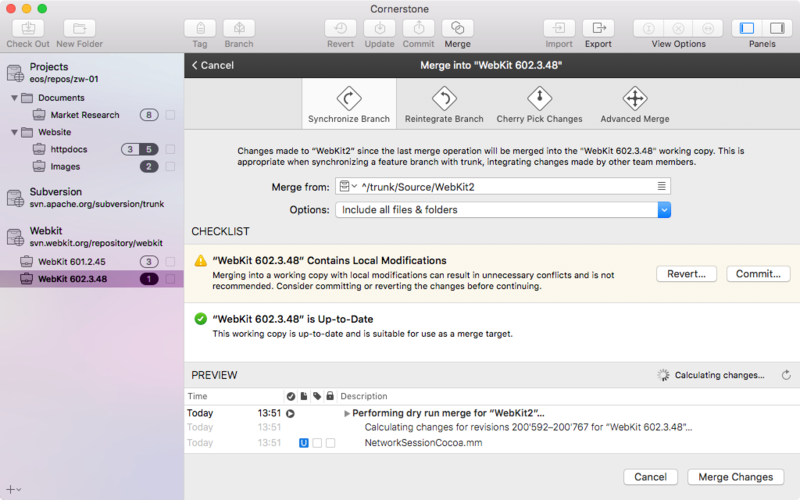 With support for a range of merging strategies, the Working Copy Checklist and the Change Preview, merging has never been easier. 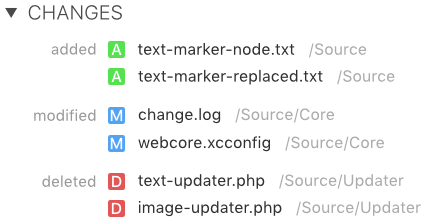 The Log shows your repository's history as a list of revisions and includes the log message and a list of the files changed. You can browse through the history of any file, find branch points and even compare the histories of multiple files at once. Click a block of text to get not just the who, but also the when and the why of the revision that contributed those lines. Cornerstone's super-powerful compare tools are right where you need them. Whether you're reviewing for a commit or inspecting other people's changes, Cornerstone has you covered. With rich syntax highlighting for your favorite languages, comparing files has never been easier. Cornerstone's class-leading text comparison comes loaded with options including line differences, invisibles and annotations. Individual differences can be undone while comparing making it super-easy to discard any unwanted changes. Powerful tools for navigating your project's history. Perfect for browsing and comparing past versions of individual files, the Timeline View presents revisions on an intuitive timeline. Browse revisions, find branch points and compare versions. And built-in filters help you get there fast. Your one-stop shop for browsing a project's recent changes, the log view helps you determine your team's progress with all revisions grouped by date in one simple list. Need more details? Expand the list of changes and double-click a file to inspect any modifications. 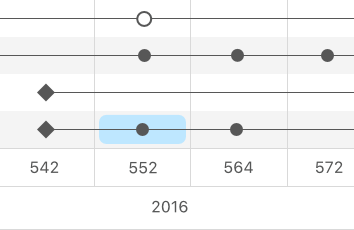 The who, why, what and when. Cornerstone's annotations work like magic. Click a block of text to get not just the who, but also the when and the why of the revision that contributed those lines. And blocks are color-coded by author so you'll know who's responsible for what. Annotations also comes with an interactive legend that lets you see not only who has been working on a file, but also unlocks its vital statistics. The transcript reveals the progress and outcome of operations such as imports, check outs, updates and commits. Pulling in code, documents or graphics from other sources? 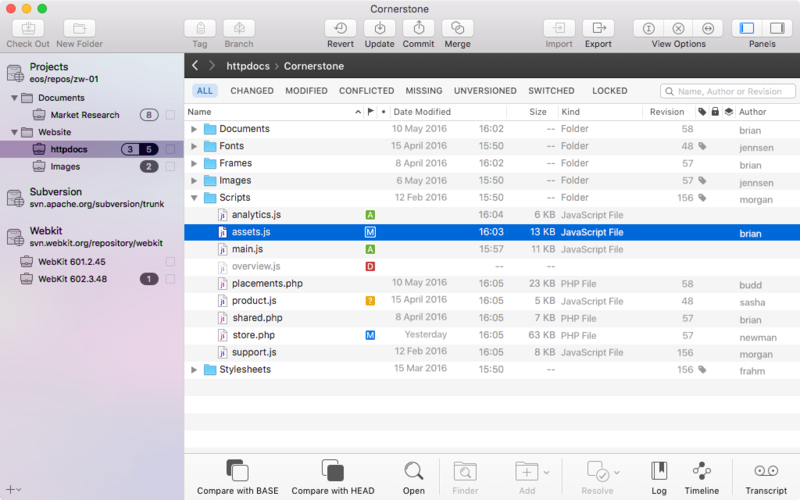 Cornerstone's dedicated externals editor makes setting them up a breeze. You'll always know how many updates are waiting for you in the repository because Cornerstone shows them right next to your working copy. Get the most out of Subversion by using Cornerstone's intuitive interface to customize your Subversion configuration. User properties are great for attaching your own stuff to items under version control. With Cornerstone you can add just about anything, including text and files. Cornerstone's repository browser gives you instant access to the contents of your repository, past and present. Cornerstone has dramatically improved my productivity. 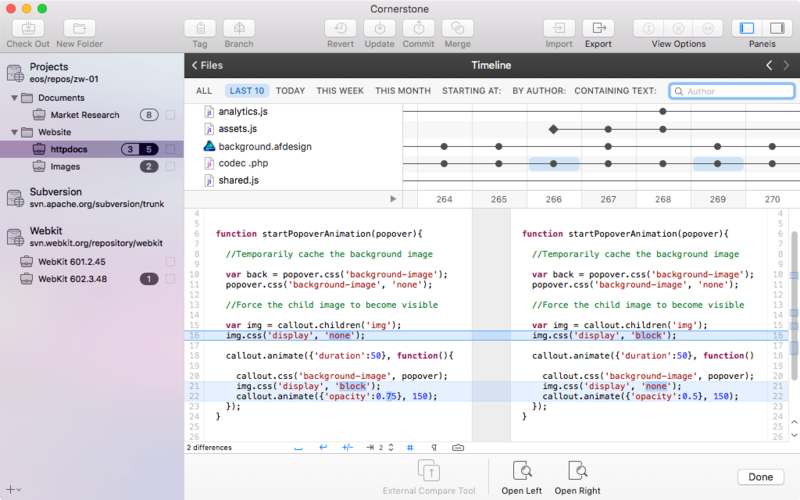 Cornerstone truly is the ultimate Subversion app. I'd never use anything else. I just wanted to say you have an amazing product. Jeremy Jack, (mt) Media Temple, Inc.
Ready to get started with Cornerstone 4 ?